Rightly or wrongly, the foosball table became the symbol of the Dot-Com Era excess. Seemingly every big-spending tech start-up of the late ’90s featured a foosball table in its office in an effort to paint itself as a free-wheeling haven for innovative thinkers. Usually, though, it just illustrated how the company was willing to throw good money after bad. It’s fitting, then, as the mobile apps bubble continues to swell a decade after the Dot-Com Boom went bust, that the foosball table is making a comeback. In this instance, though, it’s a virtual version of the table soccer game built for your iPad. And rather than serve as a symbol of irrationally exuberant excess, Foosball HD is a well-designed iOS game that makes great use of the iPad’s screen and touch controls. Gooooooooal! : Foosball HD faithfully recreates the table soccer games you’d find in arcades, rec rooms, and the occasional dot-com office. It’s not surprising that Foosball HD would so successfully translate a table soccer game into an iPad-sized package, considering that the game comes from Illusion Labs. The developer’s other App Store offerings include Labyrinth 2, a well-regarded mobile version of the old wooden maze game available in both iPhone and iPad versions. That same talent for taking a rec room favorite and recreating it on an iOS device is also evident in Foosball HD. Foosball HD’s graphics are fairly simple yet still detailed. The wood paneling along the side of the playing surface has a grainy texture mimicking an actual tabletop soccer set. The metal bars suspending the foosball players gleam, and the players and ball cast shadows on the playing surface. It gives Foosball HD a very realistic look. The iPad controls are as easy to master as the real thing. Slide your finger along the metal bar to move that row of players from side to side. A flick will send them spinning, propelling the ball forward when you strike it with one of your men. Foosball HD’s single-player mode pits you against a computer opponent in one of three different levels—easy, medium, and pro. In easy mode, your computerized opponent is extremely beatable, but the level of difficulty ramps up dramatically with each level. That’s probably because the computerized opponent can operate the three different bars of players with much greater dexterity than this clumsy-handed human. The two-player mode is where Foosball HD really shines, though, and Illusion Labs has come up with a really clever way to let two people face off on the same iPad. Half of the screen in landscape mode controls the blue team; the other half lets you control the red team’s sliders. The split controls work fairly well, though in the heat of battle, it’s easy to over-reach and grab hold of the other team’s sliders by mistake. Or so my opponent claimed, after he made me score that own-goal. Nevertheless, the two-player capabilities make Foosball HD an appealing choice for families that share gaming time on their iPad. If Foosball HD has any shortcomings, it’s what the game doesn’t offer—namely, a lot in the way of customization. All games last until one player reaches five points; there’s no way to adjust that target score upward or downward. You’re also stuck with red and blue as your team colors. It would be nice to have more options, even if they were only available as in-app purchases. These are pretty minor complaints, though. 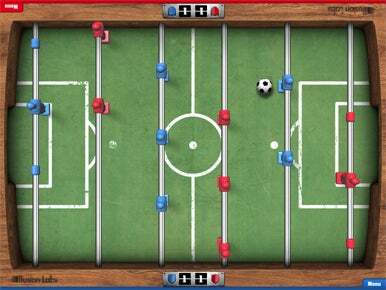 Foosball HD is a solid offering that will surely appeal to fans of table soccer games. And at just $3, tech start-ups can finally boast of having a foosball table of their own without having to squander all that venture capital funding to buy one.